People blog for all sorts of reasons. Political, religious, financial; about sports, about entertainment, about how to cook beef bourguignon, or solve the Syrian refugee crisis, or upcycle a thrift store-salvaged dresser into a shabby chic armoire. IMHO, the ultimate motivation underlying all these reasons for blogging is rooted in a universal human presupposition. We like to think that what we have to say matters to someone else. Our quest for significance drives our compulsion for utterance of our thoughts, feelings, and opinions. I started blogging in 2008 for no greater reason than peer pressure. Everybody was doing it, way back then. It was part of the normal life pattern many of our friends followed after graduating from college – get married, move, get a job or get more education and then a job, start a blog, have kids, post their pics on said blog. My husband and I pursued this chain of events until we hit a snag. This snag/pit of despair was characterized by years of longing for but not being able to conceive a child. After attempting to deal with my grief in my own strength and failing to find hope through that strategy, I began reading a friend’s blog describing her struggles with these issues. Her demonstration of vulnerability freed me to wrestle with my anguish more honestly and reinvigorated my passion for writing with a renewed purpose: to let others know they were not alone in this profoundly painful trial. 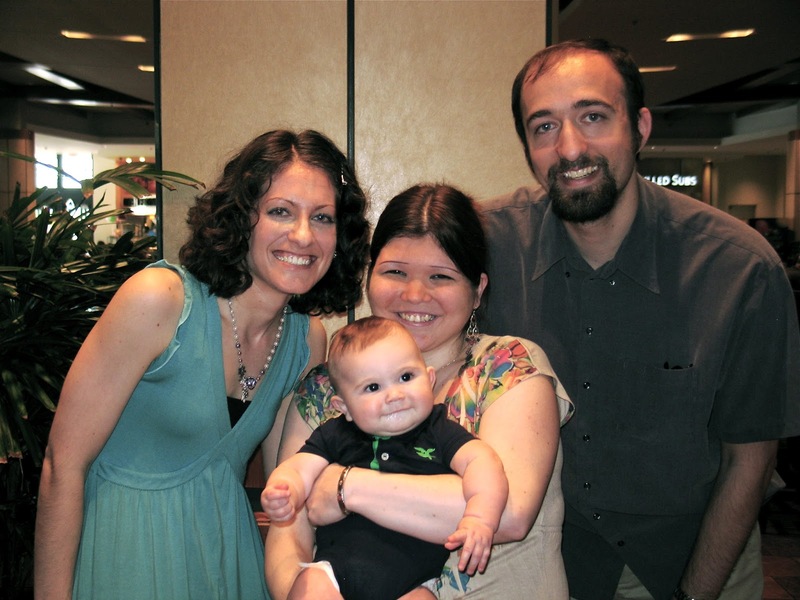 Once I had written about our failed IVF cycle, amazing adoption story, and surprise pregnancy, I became less motivated to blog except for occasional times when, as a good evangelical, I should describe as “God laid it on my heart.” My label for this is the “nudge-nag phenomenon.” God nudges my heart about a specific topic at a specific time and nags me until I write about it. His still, small, unrelenting voice is not like the nagging I do to my kids to hurry up and get ready in the morning. It is gentle, insistent, assuring, and dare I say, a whole lot more effective. That’s where I’m at now. God is nudging my heart to share my reflections about a variety of topics, not just infertility, though that is and always will be part of my story. I don’t really have a gimmick to draw readers in; I don’t craft or cook or exercise or ruminate about politics or put together a wardrobe in such a way that would inspire others. I don’t even have a Southern accent with which to issue a “y’all” call to action. I just have my words and a desire to console, to teach, to encourage, and to preach. While I’d like to feign indifference and declare that it wouldn’t matter to me if anyone ever read my blog as long as it glorified Jesus – adopting a creed like “I write for an audience of One” or some such spiritually conceited nonsense – I can’t, and I won’t. I do care if people read this; otherwise, I’d pick up where my 5th grade self left off and just continue ruminating in my personal diary (but probably with fewer contemplations on which of my friends has the cutest jeans … probably). I want to tell you about my life to tell you about my Redeemer. I want to share my unruly weaknesses, sanctified discoveries, and sarcastic annotations on life so that others can find some measure of encouragement that refreshes their faith. I want to preach the gospel to myself and anyone else who cares to listen. This is my story; this is my song; praising my Savior, all my words long. The year 2011 has gotten off to a crazy start. First, the Seahawks upset the Saints in the NFC wild card game. Then, we got a call informing us that a birthmother who had already delivered her baby had selected us as her adoptive family, and we became parents overnight. Before I launch into the story about how our son, Calvin, joined our family, I want to provide the backdrop for the amazing sequence of events that the Lord orchestrated in a way and at a time I would have never anticipated. I should also forewarn you that this post will be quite lengthy, so unless you have mad speed-reading skills like Colin and Gavin, don’t expect to pound this out in five minutes or less. In my last post I wrote on Christmas Eve, I stated that my hope in Christ as my loving Savior remained firm, which was and is absolutely true. However, my hope for becoming a mom was pretty much toast. The trials of the past year – all the failed fertility treatments, unanswered prayers, and physical and emotional struggles, in addition to the accumulated disappointments over the course of the past three years of trying to conceive – weighed down on me during the holidays, and I felt totally defeated. Being around my pregnant sister-in-law, Kim, who treated me with utmost sensitivity and respect, for which I will forever be grateful, made my heart ache simply because I didn’t know if I’d ever be able to become a mom; I didn’t know if I’d have a little one to hold and care for next Christmas or any thereafter. Many times throughout this whole process of trying to expand our family, I’ve felt that I’ve reached the end of the line, that God had dealt me more hardships than I could handle. Last month was one of the lowest of those lows, as I had reached the point that I didn’t want to pursue any more fertility treatments. We had a consultation with a specialist at Seattle Reproductive Medicine, and though it did provide some useful information, which I won’t go into detail about now, it didn’t make me much more inclined to keep trying the fruitless, expensive medical route. And while we knew there were several options still available to us, including embryo adoption and traditional adoption, I didn’t really want to think about any of them. Stick a fork in me, I was done. Done with the disappointment, done with the uncertainty, done with thinking about ever having a baby. Interestingly, during a conversation with my mother- and sister-in-law over the holidays, I told them about how some adoptive families get matched with a birthmother immediately after she gives birth, that they get a call and have to drop everything to pick up their child at the hospital, going from a childless couple one minute to parents the next. I asserted that that was something I couldn’t ever imagine doing since I’m such a planner and would not feel capable of making that drastic life change in such a short amount of time. This feeling of hopelessness pervaded my thoughts at the start of the New Year. I even began writing a blog post about the aftermath of IVF and how we’d decided to take a break from fertility treatments. But before I got a chance to finish that post, we got a few e-mails from our adoption agency. Apparently they were having a busy start to the New Year, as they had three birthmothers contact them about wanting to make adoption plans, including one who had already given birth. Colin and I read the e-mails explaining each situation and decided to show our profile to two bmoms, the first time we had elected to do so. With one of those e-mails, I broke my own rule about not looking at baby pictures the adoption agency sent for fear they would make me cry, and I did almost break down when I saw the photo of a sweet, cherub-faced baby boy sound asleep in his hospital bed. There were some health concerns about this baby, but his MRI results came back normal, so we told the adoption agency we still wanted our profile shown to his bmom. That was Friday, Jan. 7. We spent the weekend praying about the two bmoms, trying not to get too worked up about the possibility of adopting one of their babies. At church that Sunday, Pastor Dave gave a sermon about how Abraham and the rest of the individuals in Genesis who made it into the Faithful Hall of Fame in Hebrews were pretty much all screw-ups. They lied, cheated, stole, murdered, committed adultery, rejected God’s sovereignty, etc., and yet God still remained faithful to them. The sermon really spoke to me, as I’ve felt like a total failure in terms of trusting the Lord throughout these struggles with infertility, and yet He has provided for me and comforted me despite all my shortcomings. So that was encouraging, but I still felt nervous about the bmoms looking at our profiles, and had a hard time getting to sleep that night. I didn’t know it was the beginning of the end for me as far as sleeplessness goes. On Monday, the day the bmoms were going to look at the profiles, I tried to get some work done, and to distract myself, thought about what we should do with the new hutch we bought on Saturday (only $160 on craiglist!). I carried my phone around with me to the bathroom and everywhere else, and checked my e-mail every two minutes. I repeated Proverbs 3:5 – “Trust in the Lord with all your heart and lean not on your own understanding” – to myself over and over and over again. Colin went into work briefly in the morning, then came home and started to freak out, which is a rarity for him. The impact of becoming a parent instantaneously hit him before it hit me, but after some time to think about it and talk to his bro, he calmed down, thankfully just in time for my freak-out. 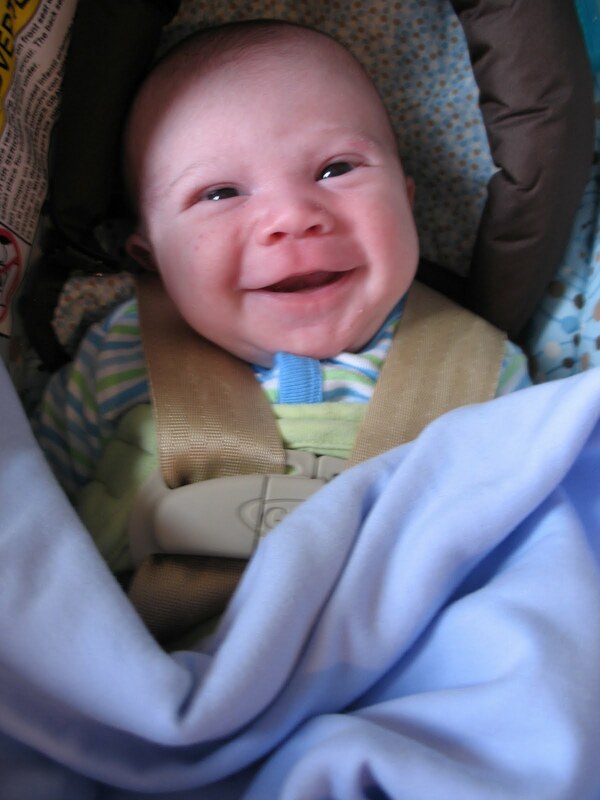 In the late morning, I got an e-mail from our caseworker, who said we were a finalist for the bmom of the baby boy whose picture had melted my heart. I gotta say, that was a weird message, knowing that we were finalists for the bmom, as if this was American Adoptive Idol or something. She wanted to verify that we were OK with an open adoption, to which we replied yes, as long as we started out slowly and used the adoption agency for facilitation. We waited for a few agonizing hours after that until 5 p.m., then I resigned myself to the probable fact that we wouldn’t hear anything until Tuesday. We made dinner, started watching the BCS championship game, and tried to relax. Then around 7:30, I got a call from an unknown phone number. It was another caseworker who told me that the bmom had looked at all the profiles and had made her decision. She had picked us. It’s difficult for me to describe my feelings at that very moment because I was absolutely shocked. My mind couldn’t process what the caseworker was telling me, and I could barely say anything to her other than “That’s great.” What a lame response to the news that you’re going to be a parent! She mentioned a few things about the baby boy, like how there were a few minor medical issues and tests to be run, but overall he was healthy and quite alert, already interacting with the nurses and others who came to visit him. She told us we needed to drive out the next day to meet the bmom and our son. Then she asked if I had any questions, and for the life of me I couldn’t think of anything, other than “What the freakin’ heck is going on?! ?” (which I refrained from saying aloud). At some point during this conversation, I looked at Colin and mouthed the words “I can’t do this.” When I got off the phone, my hands were shaking, and the floodgates opened wide. The emotions of that moment – joy, relief, fear, and surprise – totally overwhelmed me, and my stalwart husband hugged me tightly and whispered soothing reassurances until I calmed down. Honestly I don’t remember much else about that particular moment due to the shock. As you may remember, the last time I was in shock was after I got the call from the doctor that we didn’t get any embryos from IVF. So in the span of a little more than 50 days, I went from one state of shock to another, each under very, very different circumstances. Once I had regained a semblance of composure, we began calling various family members and friends and telling them the news. I e-mailed my boss and sent her all my work in progress, apologizing for ditching work so suddenly. Then I did what any sane person would do and started furiously cleaning the house, which is one of my foremost coping mechanisms. Colin resorted to his: playing Call of Duty. As you can expect, I didn’t get much sleep that night. I got up early on Tuesday and shoveled the driveway (it had snowed several inches over the past 24 hours) to help prevent Colin from wrecking his back before our drive and to help us get on the road as soon as possible. We dropped Kaffy off at the kennel and headed out in a snowstorm. En route, Colin downloaded a baby name app on his iPhone, and we started discussing possible names for our baby boy, an experience that was and still is hard to believe that we were undertaking. We narrowed it down to our top three: Calvin, Caleb, and Caden. Immediately upon arriving at the adoption agency office, we were told that the birthmother and her mom were there waiting to meet us. We walked in and said hello to our son’s biological mother and grandmother, which was a strange and wonderful experience. I won’t go into much detail about our bmom to protect her privacy, but I will say that she is a friendly, sweet young woman who impressed us with her maturity and strength. The grace with which she was handling the whole situation was amazing to me, and I am so, so very thankful for her and for how much love she demonstrated toward our son. As weird as the scenario was, we actually had a great time chatting with her and her mom, and to me it felt very comfortable and natural. She told us she picked us because of our personalities as illustrated in our family profile, and especially liked how important our family was to us, because her family is so important to her, and they’re all supportive of her adoption decision. Apparently, they had all looked at the family profiles separately, and each of them had picked the “Seahawks couple” for the adoptive family (we had a photo of us in our jerseys in the profile book), which to me is another example of God’s hand at work in this story. After socializing for a while and discussing our preferences for an open adoption – starting out slowly with pictures and e-mails and occasional visits at the adoption agency – we said goodbye to our bmom and her mom and headed to our next meeting with the attorney. Fortunately that meeting was pretty quick, and our attorney laid the groundwork for the necessary legal steps. As part of the conversation, he had to start a document for the new birth certificate the baby would be given when the adoption was finalized, and he asked us what name we wanted to give him. So right there on the spot, we decided to name him Calvin, representing Calvin and Hobbes, Colin’s favorite comic strip; giving him the same first and last initials as Colin; and providing him with an easy nickname I love, Cal. My bro-in-law John later pointed out that Calvin is a combination of Colin and Gavin – how cool is that! Finally after all these meetings, we got to go to the hospital and see our son for the first time. Walking into the hospital, I was so nervous I thought I would pass out. I’m not sure why I was so nervous then, maybe for some ridiculous fear that he wouldn’t like us. But in any case, after sterilizing my hands before entering the NICU, I walked into my baby boy’s room as if in a dream. I saw him in his little plastic hospital cradle, hooked up to a ton of monitors, and watched him breathe peacefully in his sleep. Then the nurse asked me if I wanted to hold him, and she handed him over to me, a moment I will remember forever. My first thought when I held him was “This is the most beautiful baby I have ever seen.” My second thought: “This is not my baby.” Not in the sense that I didn’t feel a connection with him, but more in the sense of incredulity. I was completely astonished that this amazing blessing was happening to me, and try as I might, I could not hold back a few tears of joy and wonder. We took several pictures, and then Colin held him for the first time, and I cried again. It was unbelievably precious for me to see my beloved husband being a loving father and cradling our son in his arms. The next several hours were a blur (well, the whole trip was a blur, but this timeframe wasn’t all that exciting, and thus can be summarized without going into too much detail). We had a quick dinner, went on a shopping spree at Target to get a few essentials like a car seat, and headed back to the hospital to see Calvin. His birthmother was there with her father, and she gave us a gift for Calvin – a little teething toy and a froggie rattle, which she had bought because I’d mentioned that I’d like to do a frog theme in his nursery. They took off, and we got to spend more time watching Calvin sleep. The nurses used this time to inundate us with instructions about how to care for a newborn. They were all so kind and nurturing, and apologetically commented on how “This is probably a lot of info to take in.” It was, and by the end of the evening, my brain was ready to explode. It was exhausting staying there so long, but definitely worth it, as we got to see Calvin open his eyes and watch us intently as he ate, which we’ve now discovered is his absolutely favorite thing to do. Needless to say, it was a long day. We got to our hotel, exhausted from all the day’s emotional activities, and tried to sleep (unsuccessfully). The next day was no less busy, involving another meeting with the attorney and a long time of kickin’ it at the hospital, waiting for the doctors to finish their business with Calvin. They ordered some tests but didn’t seem concerned about much other than his tiny extremities, which were tightly clenched and lacked flexibility. The working theory is that he was pretty squished in utero, and all the doctors thought he would improve with some physical therapy. They also had him wear some splints that looked really uncomfortable, and after getting home, we ditched them since they were too big and he obviously hated wearing them. We waited and waited and waited, all the while having nurses coming in and out overwhelming us with more info about what and what not to do. Our caseworker came in and had us sign a ton of paperwork, then finally, the doctor gave the OK to release him. That was around 5 p.m., just in time for us to hit rush hour. Calvin did great on the way back and slept the whole way, even though I kept checking on him every three seconds to see if he was still breathing. When we arrived home, our friends Chris and Elizabeth were there to greet us with dinner. They said “Welcome home, Mommy and Daddy!” and I wondered who they were talking about. On our doorstep was a pizza and bag of baby gifts from Colin’s colleagues, the first of many gifts and care packages given to us from our wonderful friends. Calvin started to wake up, so we picked him up and took him into his room. That is another moment I will always remember, as we walked into the room that our friends from church had completely furnished, with a crib and diapers and blankets and everything we could possibly need plus more. They answered our desperate call when we let them know we were leaving to pick up our son, and they outfitted Calvin’s nursery in a room that had not been prepared at all, save for the paint on the walls. On the wall, they posted signs of encouragement, including one with 1 Samuel 1:27 on it – “I prayed for this child, and the Lord has granted me what I asked of Him.” I am still amazed to think that this has happened, that God has answered my prayer. And though there are many issues still unresolved, especially concerning the legal process, and I’m pretty tired, after several sleepless nights even before we brought Calvin home, I am overjoyed to be a mommy to the most precious baby boy. Our main prayer request right now is for the remaining legal issues. To try to summarize them, the birthmother has signed consents, but the birthfather is undisclosed. According to state law, a notification must be printed in a legal journal as a formality to allow the birthfather to acknowledge paternity. From the date of publication, which will be in a few weeks, he has 45 days to step forward and try to claim parental rights before they are automatically terminated. It is highly unlikely that this will happen, and according to the lawyer, no one ever reads the legal journal. However, there’s still that scary possibility that he could find out, so we’re praying that that doesn’t happen, and that parental rights will be completely terminated so that we can proceed with our petition for custody. Of course, we could also use prayer for us learning how to be parents, and for Calvin’s legs and arms to continue improving in flexibility. There’s much more I can talk about Calvin and his fun personality, our experiences during our first week of having him, how Kaffy is adjusting to having a little person in our home, and our first court hearing, but Colin and my mom are telling me to go to sleep since Calvin is currently asleep, and from what I hear, all moms know they should sleep whenever their child is sleeping. So I’ll wrap up this story by emphasizing God’s amazing timing in bringing Calvin into our lives. He planned for Calvin to be born at a time when Colin was still on break from school, when we somehow miraculously had enough money in the bank for the hefty adoption fees, and after we had tried an unsuccessful attempt at IVF. Had we not tried IVF yet, or if IVF had worked, we would not have elected to show our profile to any birthmothers. We would not have taken home our beloved son. In my post-IVF entry, I spurned any forthcoming Christian-ese comments about how God didn’t want IVF to work because He had something better planned for us. I should’ve known He would prove me wrong, giving me a gift that is far, far better than what I had asked for in a way that I had never, ever expected could happen.